It goes without saying that you want the best for your furry BFF, right? Then, dousing them in toxic suds, synthetic lathers and chemical sprays clearly isn’t the answer. In the first of its kind groundbreaking study by the Environmental Working Group called Polluted Pets, dogs and cats were found to be polluted with higher levels of some of the same synthetic industrial chemicals found in humans. Hence, reducing your pet’s body burden is essential…starting with their grooming! Jane & her sister, Karen, started Eco Dog Care in 2010 from a commitment to making “green choices” and with passion for living and caring for their entire families, whether they have two or four feet. Eco Dog Care Product’s Simply Clean plant-based shampoo cleanser is pH balanced for dogs and infused with a signature blend of essential oils like bergamot and ylang-ylang for a scent you can bury your nose in. It does more than just clean your dog – the proprietary formula taps into Nature’s power with essential oils like geranium, cedar, peppermint, and lemongrass to naturally repel pests like fleas & ticks and keep them off your dog and out of your car & house! Rich botanicals like argan and jojoba moisturize your dog’s skin & coat for easier brush-out & healthy shine. 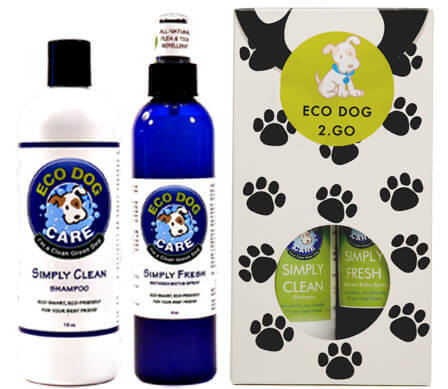 Like all Eco Dog Care products, Simply Clean is 100% biodegradable and cruelty-free. Eco Dog Care’s Simply Fresh Grooming Spray is an all-natural grooming spray so your dog (and home) will smell light & clean between their baths. It’s infused with a proprietary blend of moisture-laden ingredients like aloe vera and avocado to enhance softness & shine while making brush-outs easier on everybody. Routine brushing promotes both a healthy skin and coat but also strengthens the bond with your pup; especially helpful for newly rescued or adopted pups! Because the blend includes peppermint, cedar, geranium & lemongrass, Simply Fresh Grooming Spray also naturally repels pests like fleas and ticks so they stay off your dog and out of your car & house! Simply Fresh, like all of Eco Dog Care’s dog grooming products is 100% biodegradable & cruelty-free. Clean & Green from the Inside Out! Crisp, Light Scent on Your Pup & In Your House. 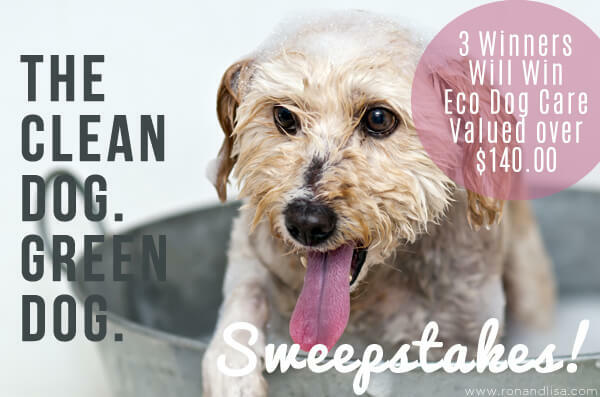 Not one, but THREE lucky RonandLisa.com readers will win Eco Dog Care’s Simply Clean and Simply Fresh, plus 2.0 Go Gift Box to keep or gift to someone else! Who’s ready to scrub and spray Fido without harsh chemicals and preservatives? Will you be one of the 3 *lucky* winners (ARV $142.20)? Enter daily for a chance to WIN and share this page with a friend, loved one – or anyone – that could benefit from a greener, cleaner dog! For every action below that you complete, you receive a specific number of entries. Click each individual action to enter yourself. For actions you have done in the past (i.e. you are already a fan of Eco Dog Care Products on Facebook) just click directly on ‘I did this’. The eligibility of the winner will be verified by The Healthy Home Dream Team®. There is no mandatory entry. Each action will earn different numbers of entries into the contest. You may Tweet or share on Facebook or Google+ for an entry once per day. All other actions will only be counted once. Sweepstakes open to US residents age 18 and over. Contest ends 4/16/16 at 12:15am PST. I love the fact that two sisters started this. My favorite product is their Start Green Kit. I would love the Simply Clean Shampoo!! My favorite product is the Simply Clean Shampoo. Simply Fresh – my hound is a stinky boy!